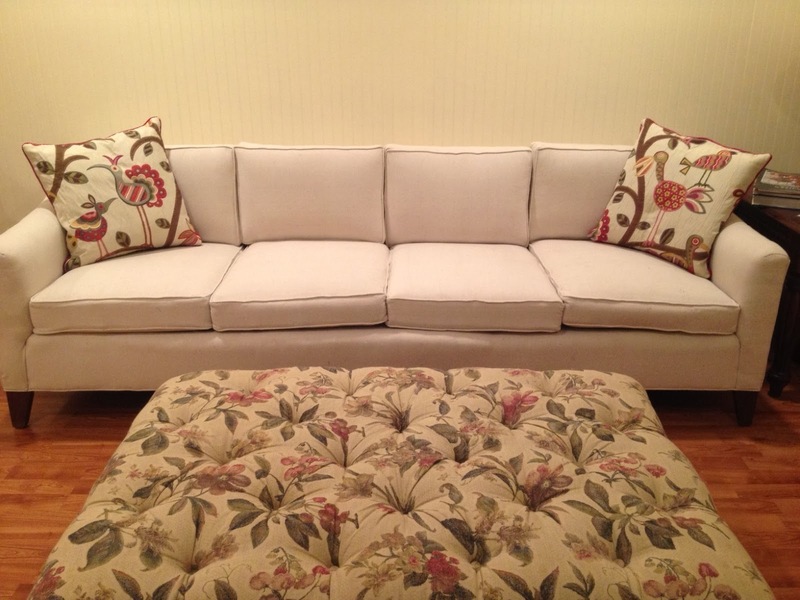 Today is our final installment of the couch reupholster series!! It's been a long journey. Probably over 80 hours of work, but the end product is absolutely beautiful. Plus you just couldn't find a couch built with this kind of craftsmanship now. Once they were ironed out flat we pinned them to our fabric and cut out around them. To find out how much cording you'll need, measure around all four sides of your cushion, double that, and then multiply it by the number of cushions you need to make. I can't recall exactly how much cording we made, but it was a LOT. In the multiple, multiple feet range. I explained in Installment 7 how to make cording. Once you have your cording made and your cushion pieces cut out the fun can begin. First take your cording and sew it in place so that the edge of your seam allowance on the cording lines up with the edge of your seam on your cushion piece. You'll be using the cording foot on your sewing machine and butting that up against the cording as shown in the picture below. When you go around your corners you'll need to make several small cuts to the cording allowance so that it will make the curve. You might not get the stitching in the corner tight enough the first few times. If you don't that's ok, you can go back and add a few extra stitches later. When you get to the place where the cording will overlap, you'll need to join them as shown in Installment 7. You'll just keep on sewing right past the joint, maybe an inch. It's best to have this joint in the middle part of the back of the cushion, that way it won't be seen as much. Remember to reverse the stitching a little bit and then go forward again so the seam won't unravel. Now to make the side piece of the cushion with the zipper. You could have kept and used a pattern piece here, but instead, we measured the height of our cushion and added 2 inches to this measurement. Fold the material in half and pin it, then run a seam all the way up the fabric, one inch in from the folded edge. At the beginning and end you'll need to reverse the stitch so it won't come unsewn. After you have sewn your seam all the way down take scissors and cut right in the middle, all the way up the fold. After you have cut up the fold, take and spread apart the flaps, laying the piece out flat. You can see there's a seam right in the middle of the fabric. Now you'll need to cut a piece of continuous zipper tape to size. (If you're reusing your old zipper this section won't apply.) Here is a picture of the roll of the zipper tape so you'll know what I am referring to. Cut your piece of continuous zipper tape to size. Open up the ends about two or three inches. Work the zipper pull on. There is an arrow telling you what direction you should go. Once you get it started, pull the zipper apart a little more and then work the pull up again. Continue this process until you are about three-fourths of the way down the zipper. Once you have completed this -- join in here if you are reusing an old zipper -- turn the zipper upside down so that the pull is facing the fabric and your zipper is in the middle of the seam. Using a zipper foot attached to your sewing machine run a seam down each side of the zipper. Remember to reverse at the beginning and end so your seam won't unravel. After you have ran your seams down the sides of your zipper, flip the fabric over and rip out the seam running down the middle of your fabric. You should have two nice folds with a zipper in the middle of them. Continue working your zipper down the rest of the way, stopping until you are about an inch from the bottom. You can also hand sew a seam horizontally across the zipper to keep it from coming all the way off. For the rest of your side bands you'll need to take your measurement and add one inch (for a half inch seam allowance on either side). Now you simply need to sew the pieces together. You'll want to put the zipper piece in the back, where you cording joint is. Sew your sides on to the top and bottom piece. Remember it's kind of counter intuitive as you'll be sewing inside out and you'll need to flip your cushion back outside in when you are finished. FINALLY..here is the finished product!! Much, much improved from it's previous 60's incarnation! Click here to see the before!